In Agra when you enter, the first place that comes in your diameter is Agra cantonment railway station. There are many hotels adjacent to it that provides perfect lodging facilities. Agra cantonment near Sadar bazaar towards the southwest is the main railway station of Agra. North Central railway is responsible for its management. 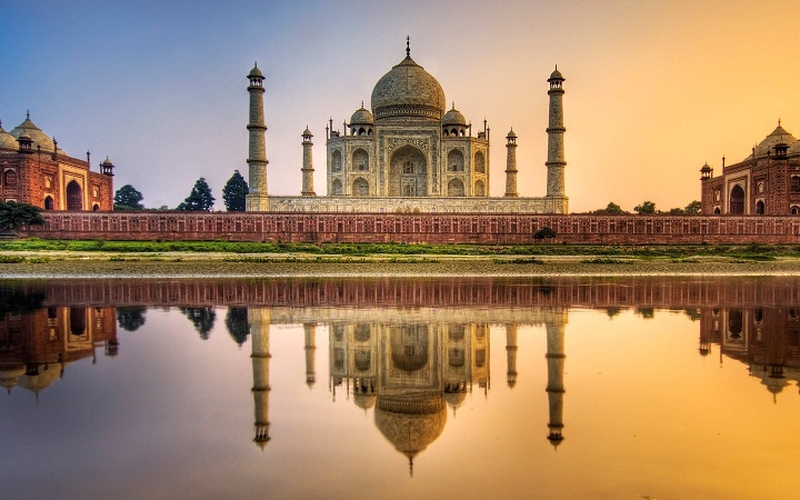 In the North Indian State lies Agra which is popularly known as city of Taj. In 16-17 century when Mughals were ruling, Agra served their capital city and awarded with beautiful fort and monuments that were erected during their reign. Taj Mahal built by Shahjahan in memory of her beloved wife Mumtaz is now considered in the Seven Wonders of the World. It is almost 350 years old. Similarly Agra fort is another significant monument in Agra that was built by Akbar. Not far away from Agra lie Sikandra and Fatehpur Sikri, which also have evidence of Mughal’s era and is worth a visit. All those who have little interest in buildings can visit Agra for its expertise in handicrafts, leather work, brass water, carpets, jewelry, embroidery work, zari and marble work. Located in the vicinity of Idgah colony, Agra cantonment is the main railway station of Agra. It is also a North Central Railway’s divisional Headquarter. Some of the trains connecting Agra to Delhi are Gondwana Express, Taj Express, Shatabdi Express and Jhelum Express. Inside the railway station is the tourist reception centre for the convenience of the travelers. There are also facilities of buses, auto rickshaw and taxis outside the station to take passengers to their destination in the city. Idgah Bus Stand is also very near to the station and there are various accommodations available near the railway station to provide easy lodging. Hotel Amar: One of the most frequented hotels of Agra is Amar hotel located at a five minutes drive from railway station. Not only this is located in the heart of city but it is also near to many tourist attractions. This place is ranked 3 stars and usually visited by bossiness men and people with leisure. It has 66 rooms, few of them are air conditioned and few without them then there are suites and the luxury is well maintained by modern utilities. This hotel’s hospitality is acclaimed all over Agra and it is considered as the best hotel in Agra. Hotel Atithi: if you are looking for budget hotel in Agra than Atithi hotel is the place to go. It offers luxury in minimum price. It follows the motto of guest are the Gods in disguise. The ambience of the hotel and its hospitality has been popular from decades and its food is absolutely delicious, it not only serves Indian but Munhall cuisines too that gives the perfect feel of Agra. This hotel is approx 5Km from Railway station. Taj Mahal: one of the Seven Wonders of the World resides in Agra that is bringing tourist to Agra since many years. This is a mausoleum built in memory of Mumtaz Mahal by her husband Shahjahan 350 years ago. He was also buried near Mumtaz Mahal’s grave. The beauty of Taj on a full moon night increases many folds and therefore there is lot of traffic on that day. Agra Fort: one of the oldest monuments in Agra is Agra fort, built by Akbar in 1565 AD. The Mughals had the excellence sense of architecture and this Agra fort is a master piece in itself. There are many buildings inside this fort like the Moti Masjid, Diwane-E-Am, Diwani-E-Khaas Jahangirs place, Khaas Mahal and the Sheesh Mahal. Musanman Burj near Jahangir palace is the place shahjahan died. Itmad - Ud – Daula: another significant monument in Agra is Itmad - Ud – Daula that was built by empress Noor Jahan in memory of her father Mirza Ghiyas Beg. It has inlayed petra dura and screens of marble lattice to glorify the beauty of monuments. It is located across river Yamuna. Chini Ka Rauza: just 1 km away is a tomb of a Persian poet and minister at Shah Jehan's court, Afzal Khan. It is called Chini ka Rauza because of the brightly colored glazed tiles used in the building. Radhaswamy Satsang, Dayalbagh: it is built in memory of Radha swami satsung. This entire building is being made with marble and all kind of ornamentation is applied in its making. However this is not complete yet. I am happy to be alive. I love life and lives every moment of it as it is the last. I believe in "live and let live".